I took a boyfriend home for Thanksgiving at my Ex-Stepfather’s house. Once. Ethan came from a small, immigrant family and thought my description of tons of food, alcohol, card games, and siblings sounded awesome. If you haven’t played Hearts, check it out on your computer or phone. It’s a cumulative point card game where you have to follow the suit that’s led, every trick you take with hearts gives you points, and the Queen of Spades is worth 13 points. 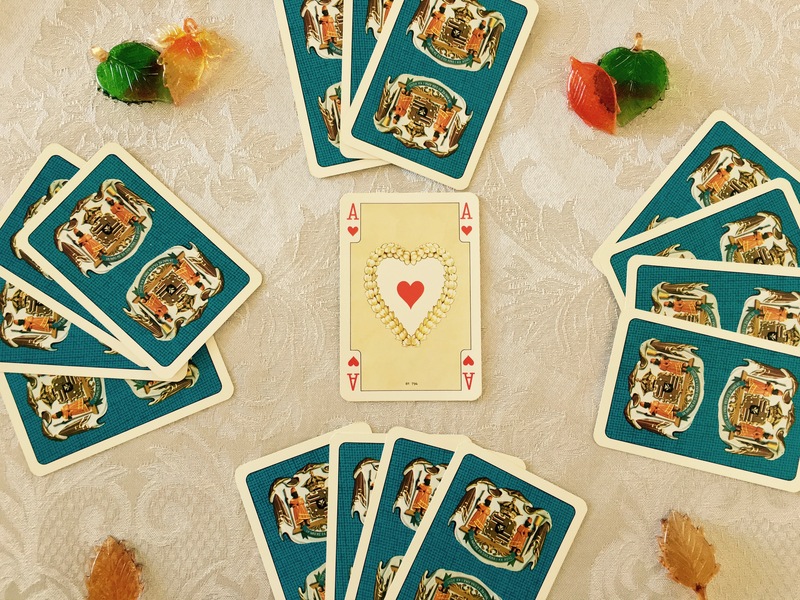 You try not to get points, but if you should take all the hearts AND the Queen of Spades, you’ve “shot the moon” and everyone else gets 26 points. We split into groups and play it for hours. There’s no money at stake. We only play like there is. Ethan rolled his eyes at me, pooh-poohed my concerns, and changed the subject. With a last mutter of, “On your own head be it,” I gave up. On Thanksgiving, Ethan threw down a little Hearts trash talk in the kitchen. Big Brother, Baby Brother, and Brilliant Blonde Lawyer Sister promptly handed him a deck of cards and whisked him off to the living room. I tried to follow. With a smug grin, she turned her back on me. I returned to the kitchen table, where Ex-Stepfather shuffled cards. Our game was tame. Civil. Our quiet conversation was broken only by snatches of conversation floating in from the living room. Mostly we heard Ethan’s indignant voice. The only responses were shouts of laughter. Or evil giggles. Ethan would stop scowling, give me a cheesy grin, and flash a big thumbs up. Ethan sulked through dinner. No one in my large, noisy family noticed. I left Mr. Pouty and joined my siblings. They enquired after Ethan. I wondered why I flew three thousand miles every November. Ethan and I stayed together longer than we should have. I wanted to dance, Ethan wanted to play video games. I suggested going places, Ethan suggested staying home. We made each other miserable, but when I finally told him I was done, Ethan didn’t take it well. There was blaming, moaning, sulking, and stalking. Some people just aren’t cut out for real-life Hearts. I hope Ethan doesn’t read your blog lol. …but I love playing Hearts. Ruthless is the way to go. But I have a feeling your three sibs would gang up on a hapless outsider, unless you play teams. Well, by us. But other people play solely to win themselves. They are very clinical. Then maybe I am one of your long lost sisters? People sometimes can’t handle how I play. Vengeful German blood must run true. I like the way you think. That’s how I play. Sorry, but there’s not much worse than a sore sport who sulks at the dinner table. I’ve dated at least one of those guys and had the same kind of Thanksgiving once, except there wasn’t even a lost card game. He just couldn’t deal with my boisterous family. Oooooh, can we do pop psychology? Was he kind of a spoiled boy? Did his background include nannies or overly doting parents? Spoiled! He really never grew up, which made him lots of fun to be around, until the pout came out. Oh, I could go on with the pop psychology but will stop there. Ha! Yeah. Spoiled boys are like that. Your family is a boyfriend screener. If someone can live through a weekend with them and be happy, they are gold! You make me wistful for my old family Thanksgivings. I’ve only realized recently, now that I’ve been away from it for a few years, what a great holiday it is. It is quite a bit of fun. When you aren’t wanting to throttle family members. Will you write about Andy’s first thanksgiving with your fam? And vice-versa? Don’t worry, Hawaiian Thanksgiving is coming. Sadly (maybe) Andy’s never spent Thanksgiving in D.C. He chooses what we do for Thanksgiving, and I get Christmas. Thank you, Mabel! I think it’s a fair portion of luck, too. Sometimes you just get crappy cards. No card games in your family? The annual mah-jong game at our house on Chinese Year’s Eve between my husband and his buddies can be brutal as well. It is intense with money on the line! I always know when my husband is winning because his laugh echoes through the house. Do you hide out in the bedroom? And is there A LOT of money on the line? I have never played with real cards, we usually play other card games in Spain. What is the #1 Spanish card game? The only time I play cards is when I get together with my kids and grandkids on the holidays. The only trouble is, they’re all so darn smart and fast. To make matters worse, brilliant daughter #1 and her equally brilliant husband have always liked games, so they taught their kids from an early age, and now the kids are in college. I have no hope of keeping up with them. I just smile and ask AGAIN for an explanation of the rules. Give them “Firefly.” It takes about an hour just to set up the board. And then you can crush them because what it really requires is the ability to multitask and keep your eyes on multiple goals.